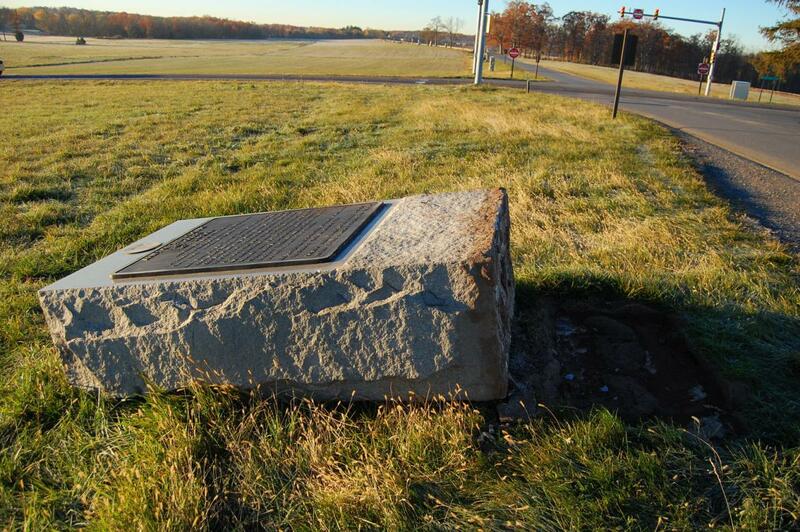 The marker to the 1st Division, 1st Corps, of the Army of the Potomac. The McPherson Barn is in the right background. This view was taken facing west at approximately 7:40 AM on Friday, November 12, 2010. 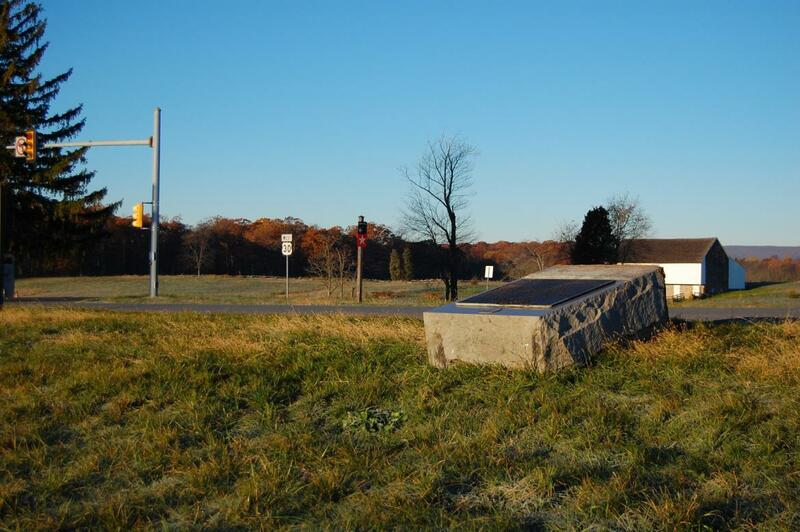 Sometime during the night of Thursday, November 11, and the morning of Friday, November 12, the marker to Brigadier General James Wadsworth’s First Division was toppled. We happened upon the marker at the same time that a National Park Service Ranger did. 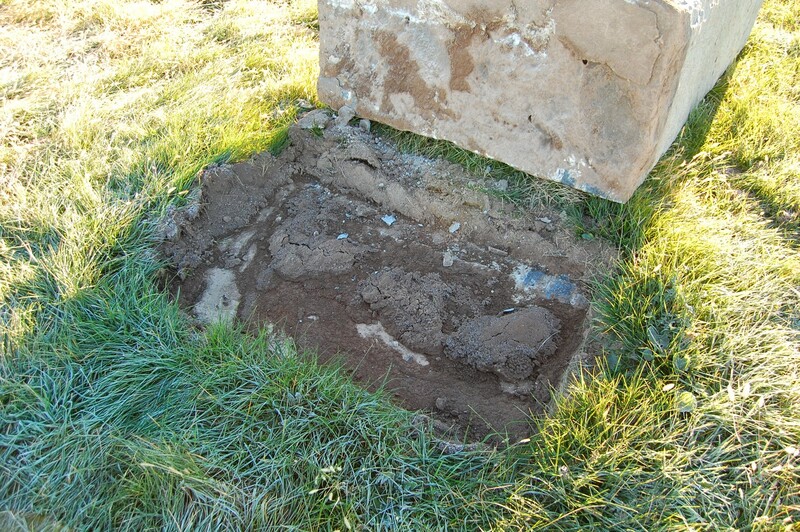 It is unclear at this time whether the monument was struck by a vehicle or whether it was knocked over by other means. 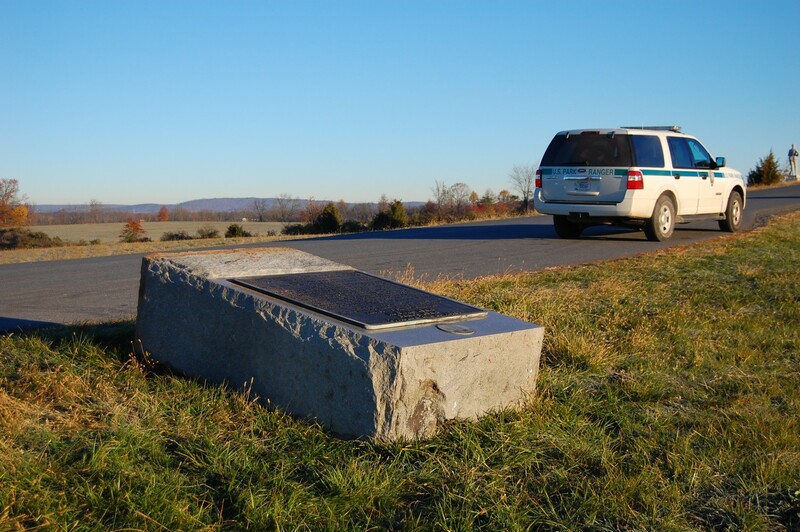 If the marker was struck by a vehicle, it would continue a pattern of motorists striking markers and monuments that are close to the road on highly trafficked areas of the battlefield. Reynold’s Avenue is certainly used quite a lot by locals and is open to local through-traffic even after the park is closed. This view was taken facing southwest at approximately 7:40 AM on Friday, November 12, 2010. Some folks have mentioned that there is a curious lack of tire tracks that would indicate a vehicle striking the marker. 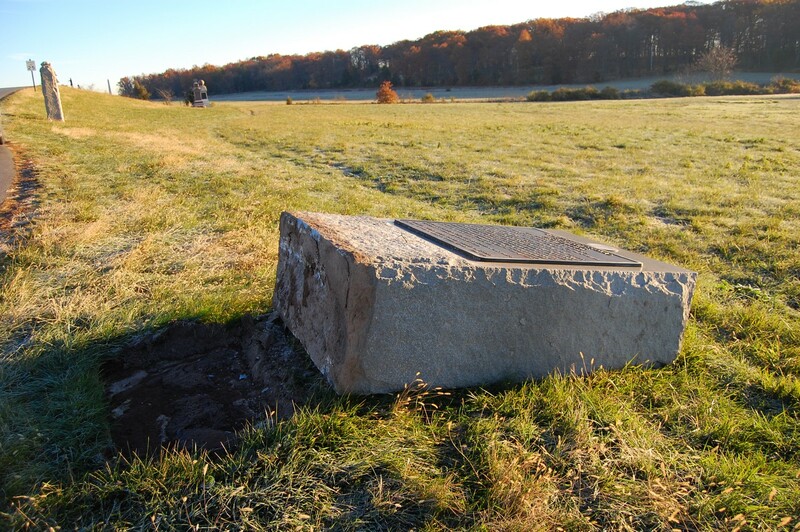 Although, the ground did frost Thursday evening and it’s certainly possible for the marker to have been struck without there being tire marks/tracks. This view was taken facing northeast at approximately 7:40 AM on Friday, November 12, 2010. It must have been quite a feat to have dislodged the marker without the assistance of a vehicle. This view was taken facing southeast at approximately 7:40 AM on Friday, November 12, 2010. Of course, if it was struck by a vehicle, why isn’t there some sign of impact on the marker? This view was facing northeast at approximately 7:40 AM on Friday, November 12, 2010. And we weren’t the only ones asking these questions. The National Park Service Ranger who arrived on the scene moments before we did seemed perplexed as well that there were few identifying signs of a vehicular collision. The monument to the 12th Illinois Cavalry is in the right-hand portion of this shot. This view was facing north at approximately 7:40 AM on Friday, November 12, 2010. 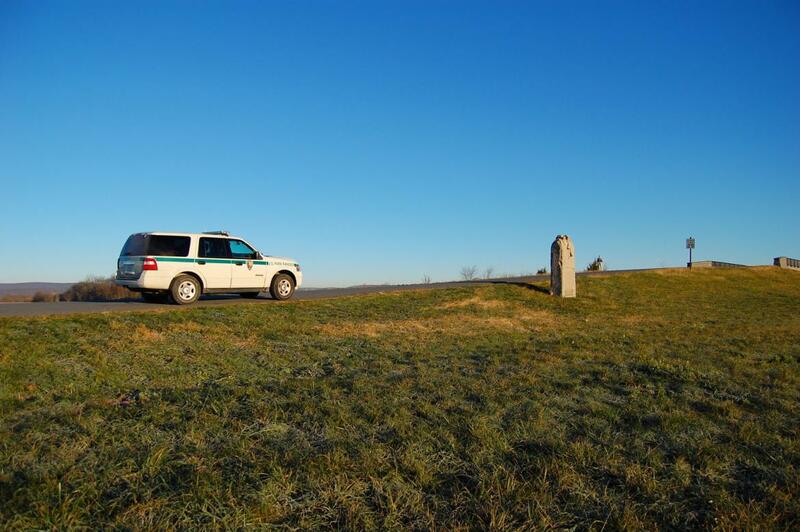 The ranger diligently called in the incident to the monument preservation team within the National Park Service and expressed his hope that it can be righted quickly. We couldn’t agree more. 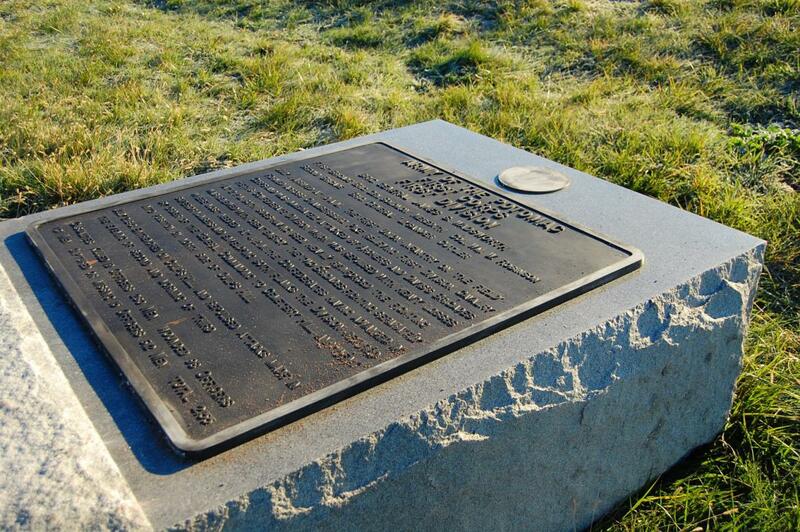 The marker was placed on the battlefield in 1910 by the Gettysburg National Military Park Commission. This view was taken facing north at approximately 7:40 AM on Friday, November 12, 2010.